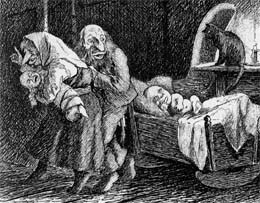 Changelings are mythological creatures from Western European folklore, where people believed fairies stealth into the bedrooms of sleeping human infants to trade the new baby for their own offspring. Often these supernatural entities were unwanted by their own fairy mothers due to being frail, ill or violent. Legends mention on how these fairies would sneak into the homes of humans and exchange their children for a health human one. The changeling would transform to appear as the human infant as not to alert the mother or anyone else of the swap. Folklore listed several characteristics which would reveal the presence of a changeling. This creatures would possess undesirable traits such as large appetites, behaviour problems, unable to speak or speak strangely, pale skin, disfigurements, along with any late developments in child’s growth. Even a few supernatural quirks been included like superhuman strength, intelligence, levitation or sudden gain in size over night could expose a changeling. If a mother was confident that her infant was a changeling and wanted to get her own child back, she would need to openly threaten to punish the baby. Any danger to the creature would cause the mother fairy to come back and exchange babies again. Legends mention by attempting to throw the infant into a fireplace, dropped into a boiling cauldron or like in the case of Michael Leahy, drown the child could provoke the mother fairy to return. Today, the legend of the changeling is known to stem for the birth of deformed or developmentally disabled children. Researchers found that down syndrome, autism, cystic fibrosis and cerebral palsy would mirror the description of changelings outlined in folklore. In the case Michael Leahy, he probably had a childhood disease that Ann Roche misunderstood resulting in the tragedy. Even in modern times, some believe the myth is real and even occurs with adults. In the last century, there are a couple of cases where family members suspected a love one were a changeling. A new twist to the legend involves aliens where people abducted been replaced with a copy which not to arousal suspension. Thus people invent myths and legends to account for birth defects and severe health conditions. Too bad, mankind has not put more effort into building a more loving world. The mother in 1826 committed murder albeit she tried to rationalize it away with this idea of a changeling.